So I was figuring that, since I took a cascade juniper in the last post (here ) and turned it into an upright tree, I thought I might show a tree that’s more suited to the cascade style. Lets talk about that for a moment. Note the point on the leaves. 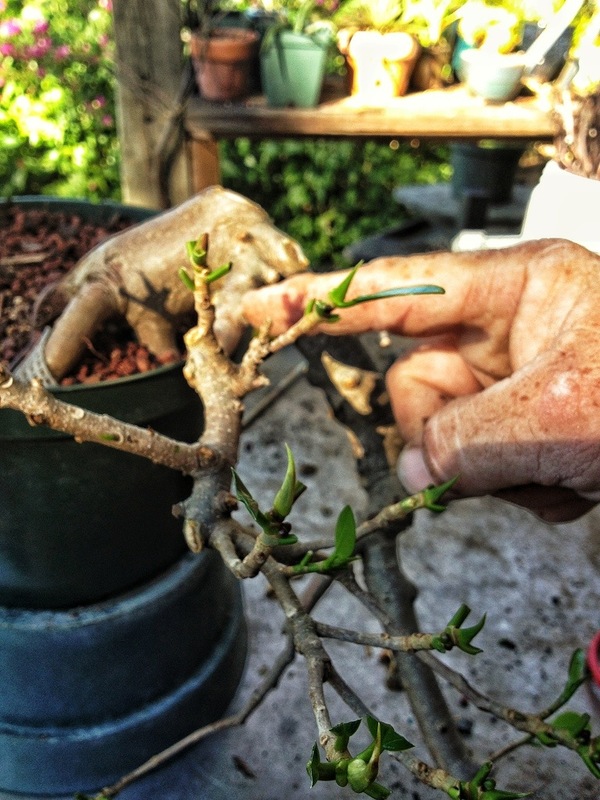 The microcarpa is such a variable species that its difficult to tell what is what. 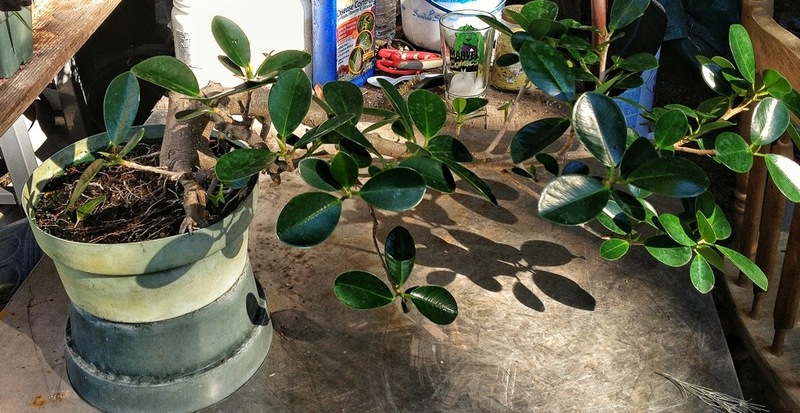 The two varieties that are confused are “green island” and “green mound”. What’s the difference besides the leaf? 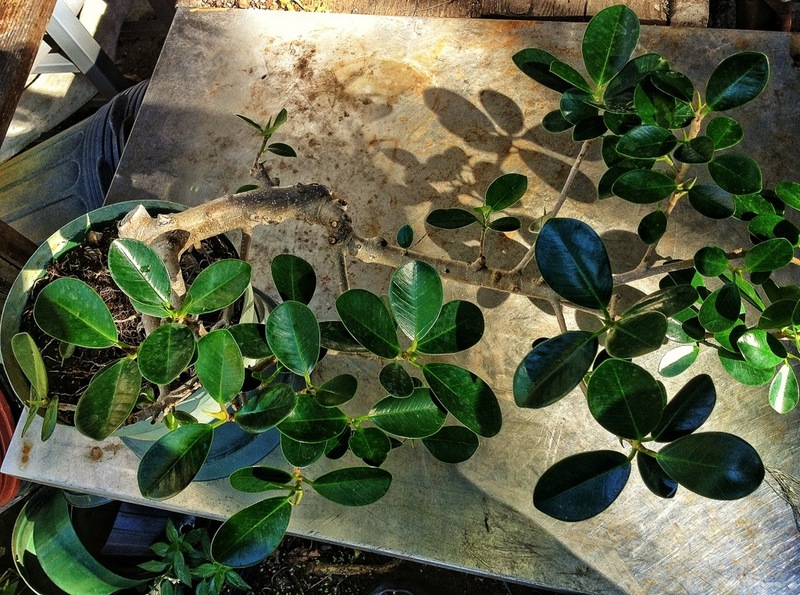 Basically, though, green island has a round leaf. Green mound has a point on the tip. What’s, the point of all this? Well, I’m not beating round the bush (Catch that?) but if I use the correct terminology I might at least appear more intelligent. 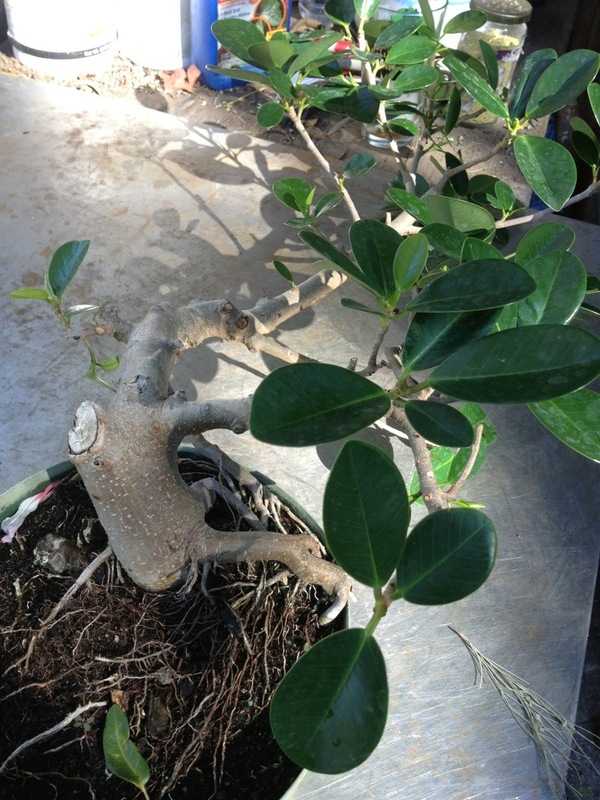 Here’s the tree we have to work with. 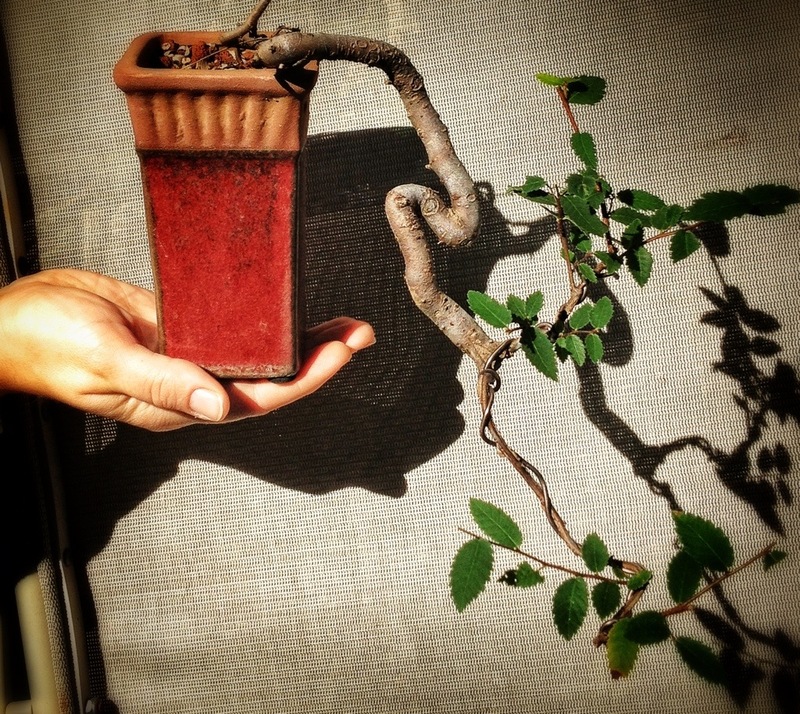 It’s a very good candidate for a cascade tree. Kinda hard to see. I know, lets get naked! That didn’t seem to help. At all. Maybe if we defoliate it? 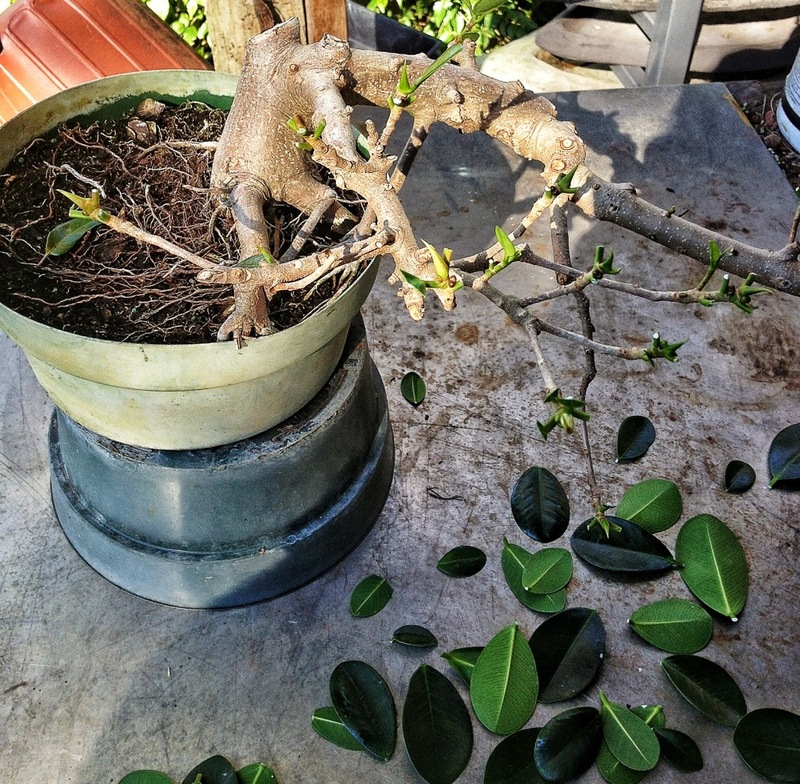 Snip, snip, snip….. Ah. That’s better. 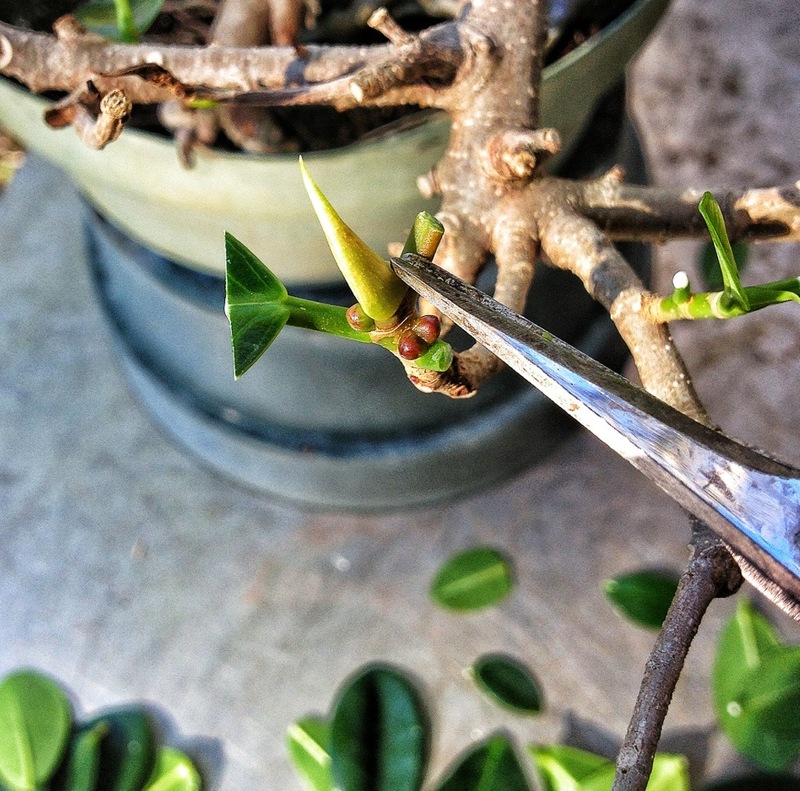 Being December in Florida I am pushing this a bit but I am making sure to preserve the terminal bud.. 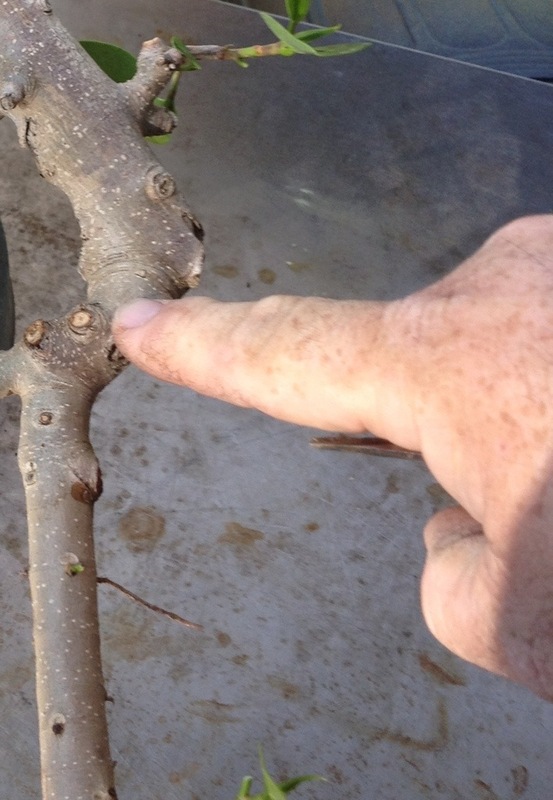 Which is that light green, flame shaped thingy on the branch tip. 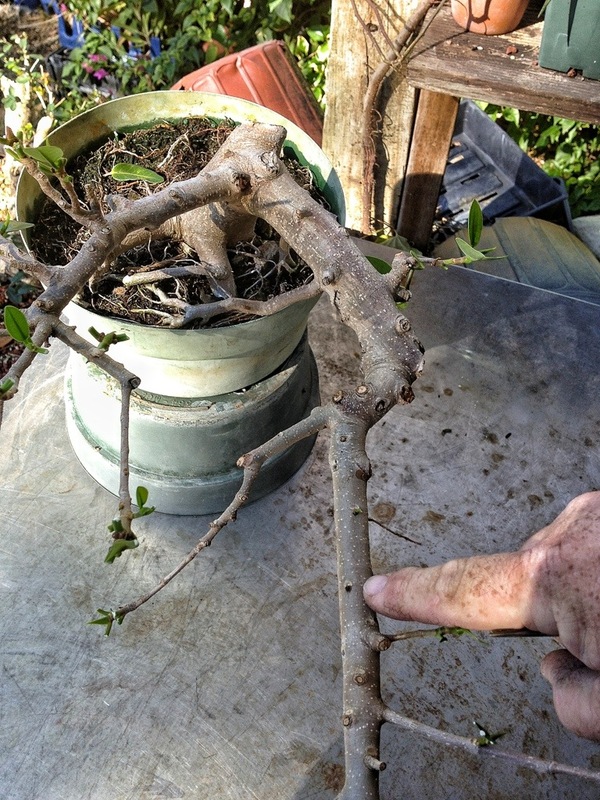 If I’m not careful in this low growth period I could loose branches. That’s better. It has good tapering tendencies but it is awfully straight. The first section is not bad. If you think about this being a tree growing on a cliff or under an overhang it is logical for the first part to grow straight in order to reach the light. I like this hard switch to the left. You might imagine a rockfall breaking it and a side branch took over. We will endeavor to bend this length of straightness into sumpin’ purty. Let me relate a story I got from Ben Oki. He was told this by his teacher, John Naka. A cascade should have twists and turns and ups and downs. It should never look like a man’s urine stream; a gradual, even arc falling into the bowl. I mean, who wants to see that? Right? With the appropriate hand gestures and pantomimes. 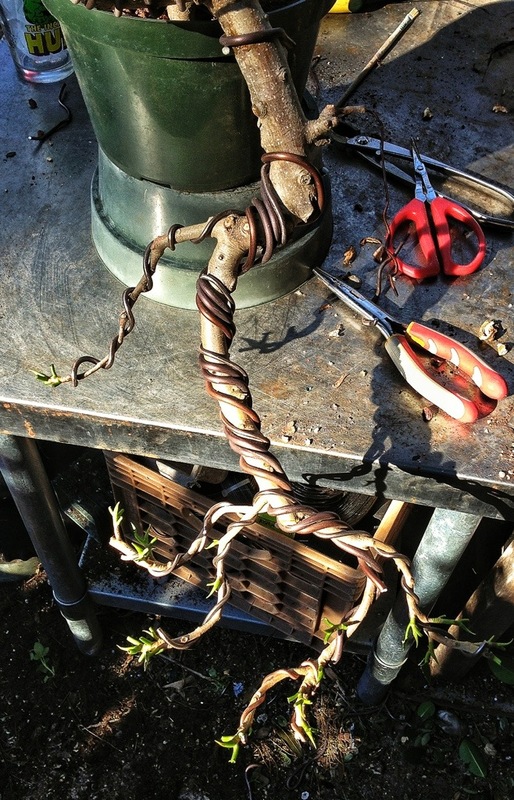 Before I apply wire I usually like to address the planting angle. 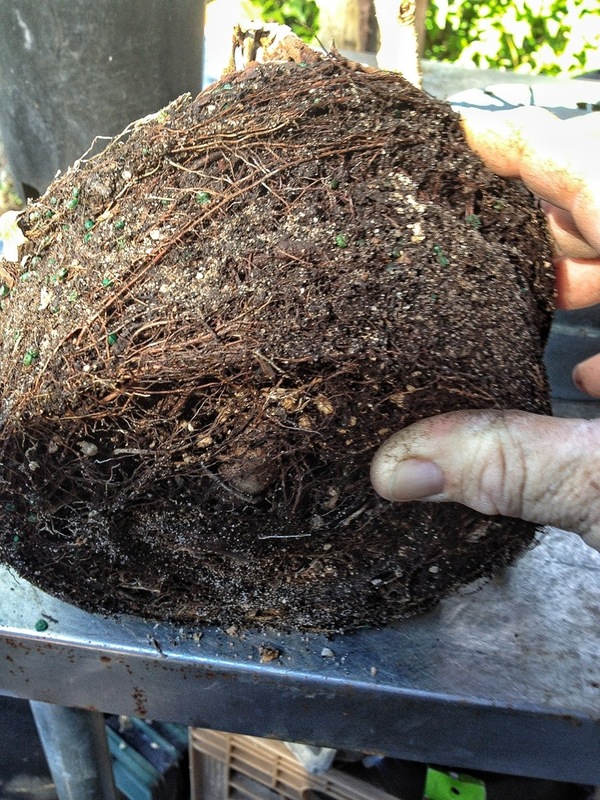 Which usually means messing with the roots. 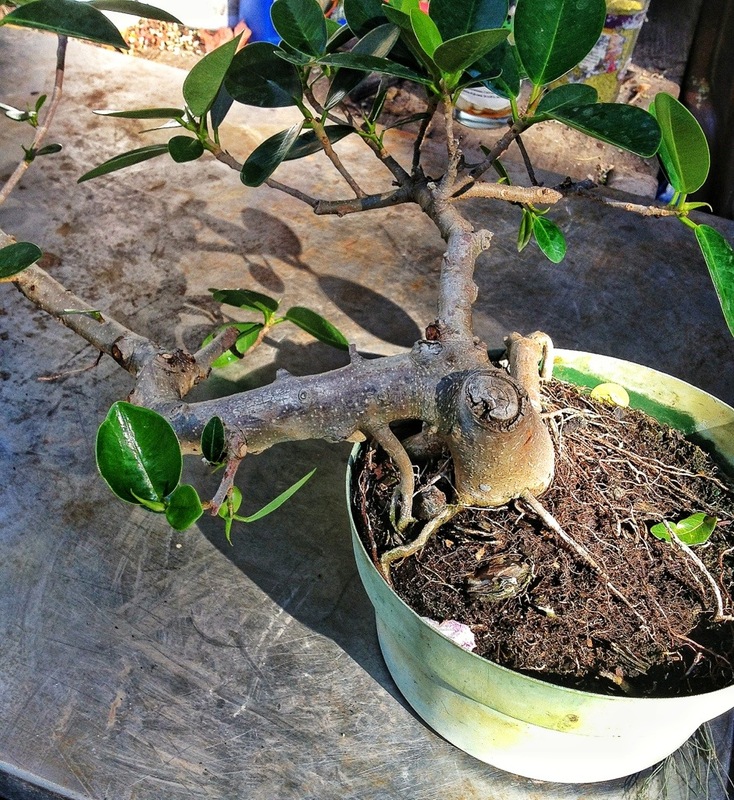 But, this being December (winter) or so, I won’t do a thorough repot. 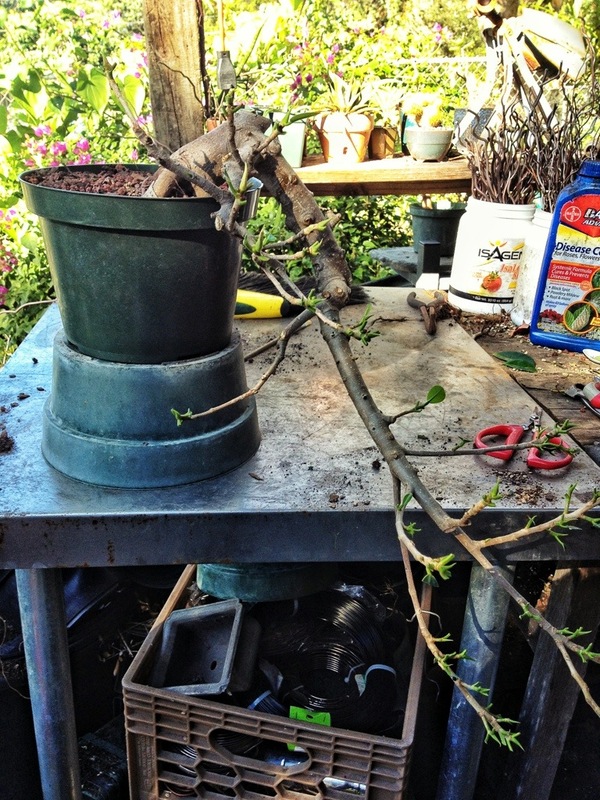 Just enough to fit it into a taller pot and stimulate it a bit. 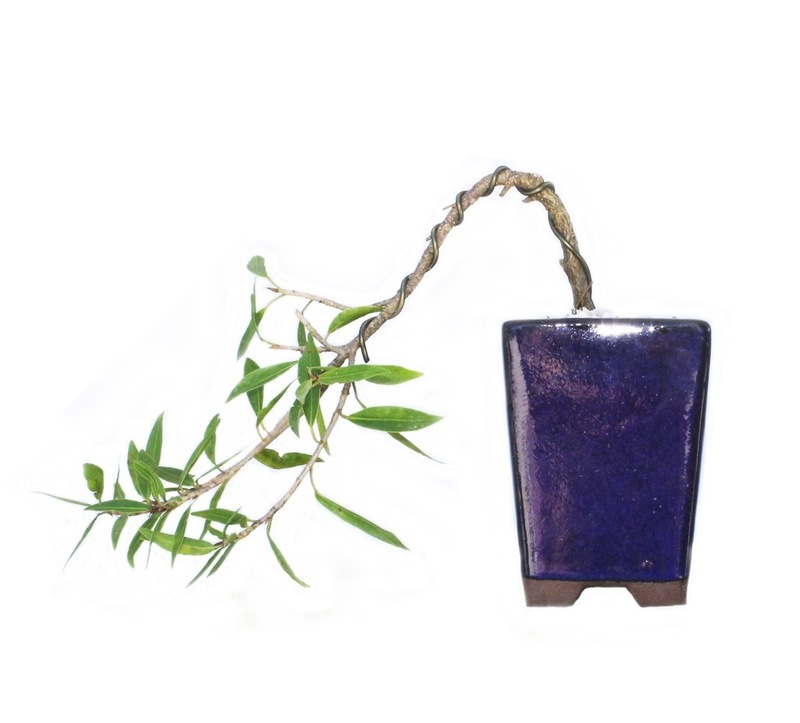 Those are a mass product bent over into a cascade merely to sell a tree.. They need a certain number of cascades in stock, so a straight trunked cutting gets wired down in an unconvincing bow (like a man’s pee pee). Plus they go to the left. Which is backwards. Totally. 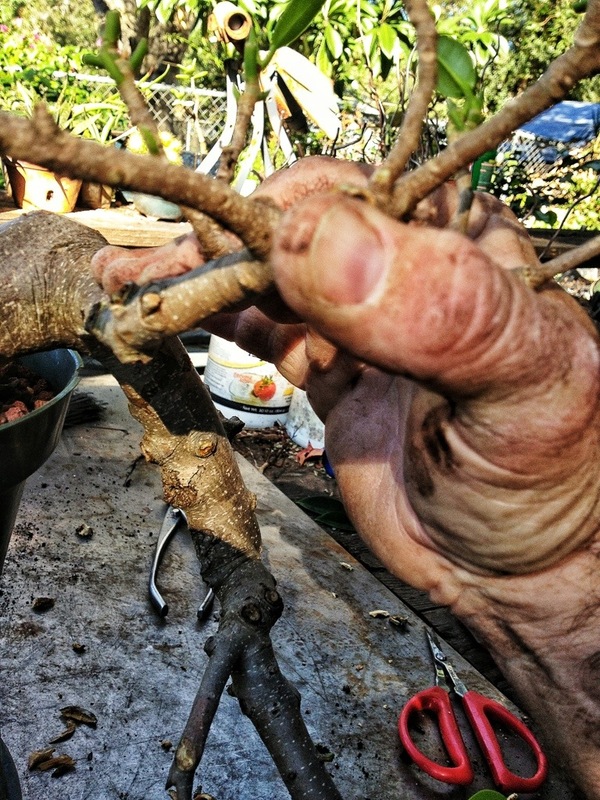 Just a little root binding to get the placement right. Now I’m ready to wire. This will look excessive but this is an initial styling and it is necessary. It will not hurt the tree (unless it’s a lightening storm you’re worried about) and, to answer the inevitable question I will undoubtedly be asked, the wire will stay on until it needs to be taken off. In this case, probably mid spring. If I were doing this in spring or summer the answer would be: maybe a month. The truth of it is, that the real answer to that question (if the artist is honest) should always be an ambiguous one. Why? Because there is not a real answer. 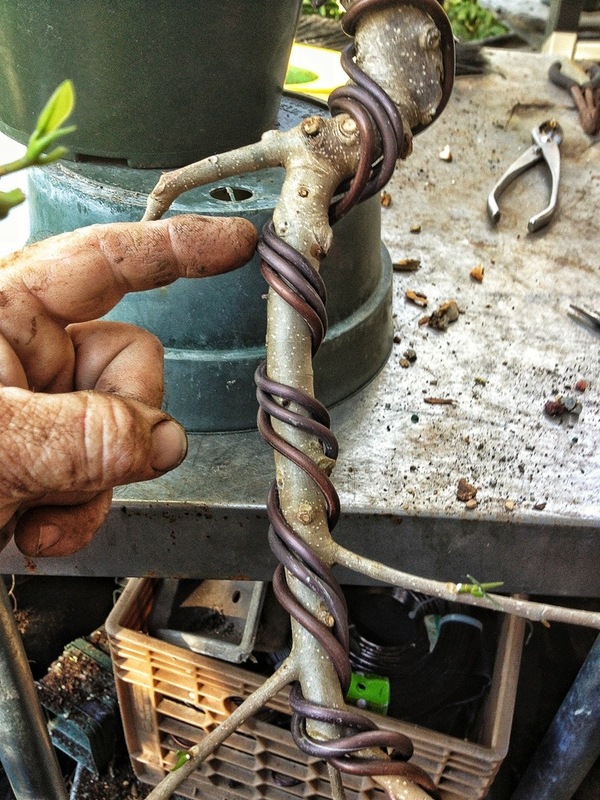 This is art, not science, and dealing with a growing thing, it is the way the tree responds that will be the ultimate indicator as to when the wire must be removed. 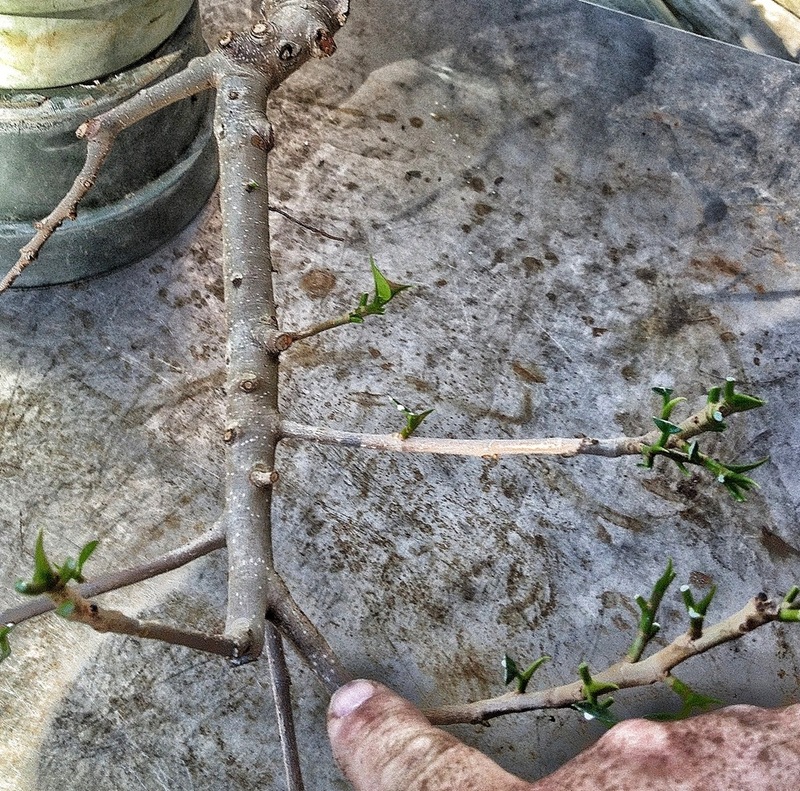 This branch will become the new top. For now. I may remove it later but, this early in the styling process it doesn’t hurt it. It actually will help it grow. 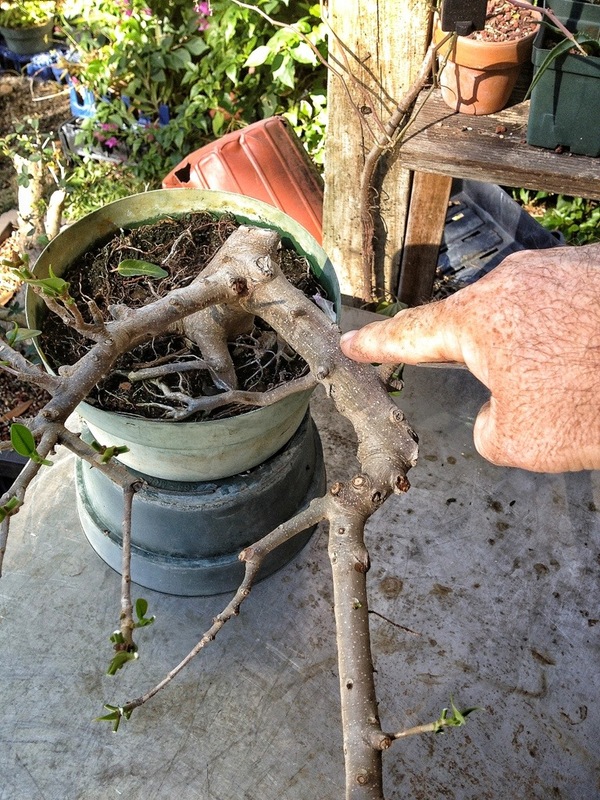 This branch is still flexible, to a degree…. Like this. ‘Nuff said to my rough and dirty hand detractors. No more picking on me. Three. That should do. Not very pretty but it will work. 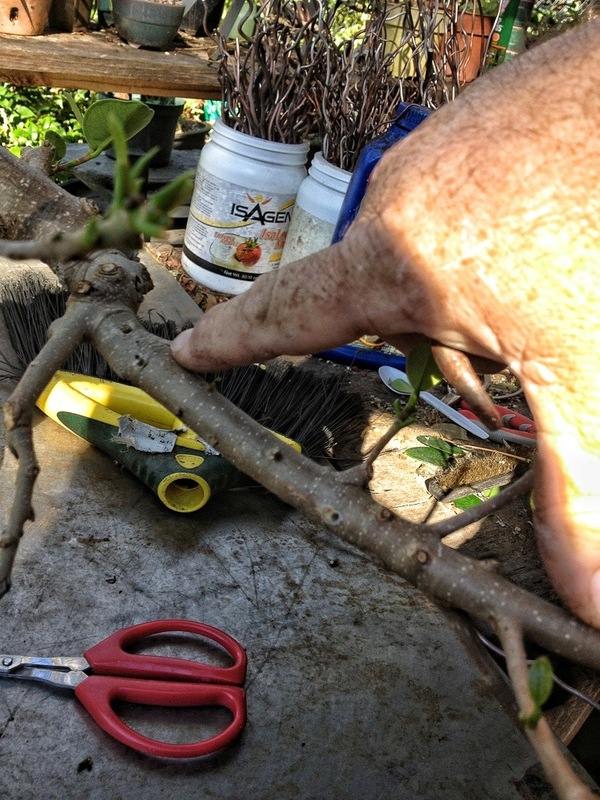 In bonsai articles and demonstrations you don’t usually see this step. The artists try to pretend that this doesn’t happen. There are actually steps in between the before and after pictures. This is the real deal mofo. 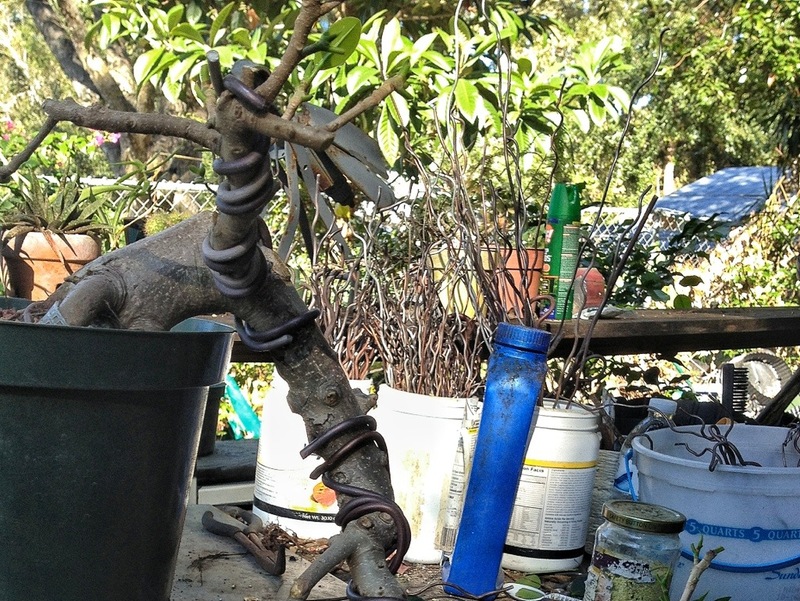 Dirty hand bonsai! I made sure I put the wire on this point. 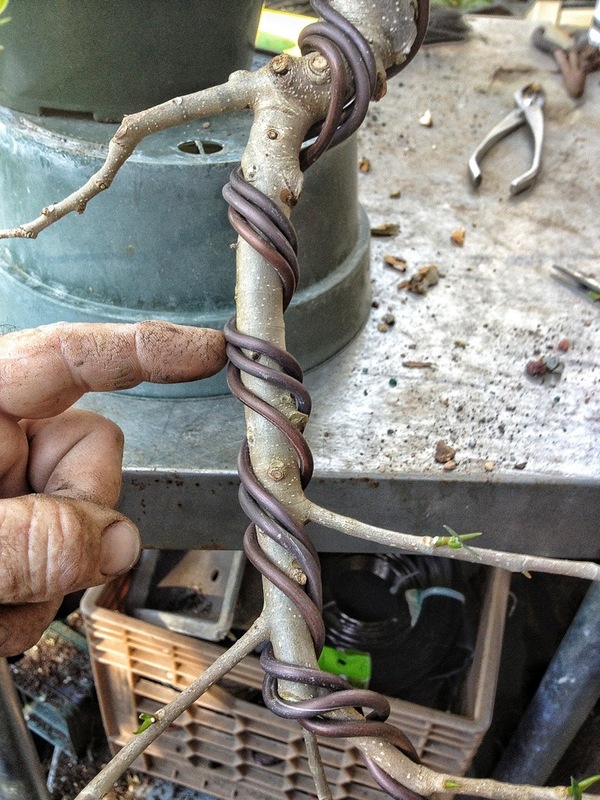 So when I bend the wire those wraps of wire will brace the bark and keep it from breaking. Hopefully. Bend bend bend BEND BEND GRRRRRR AHHHH! 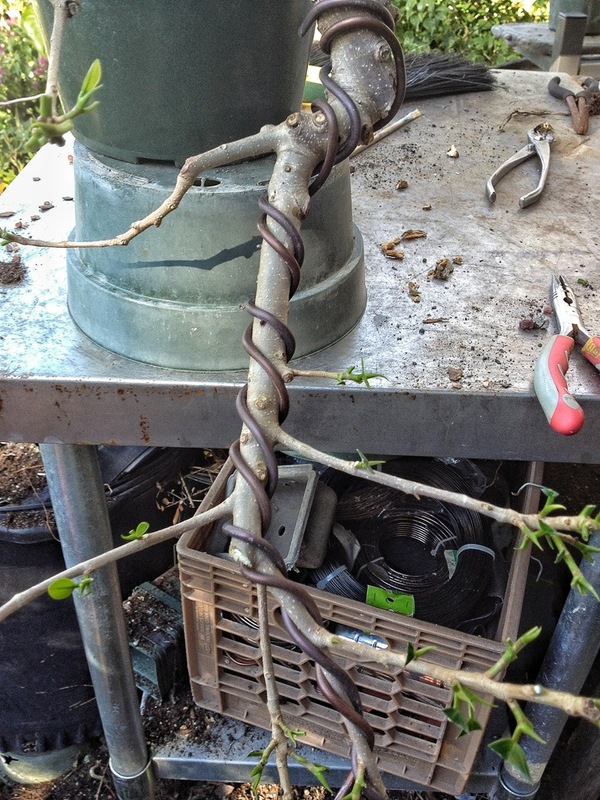 Even though this is a cascade the tips of the branches should still curve up. On all trees the new growth points up; reaching for the sun. 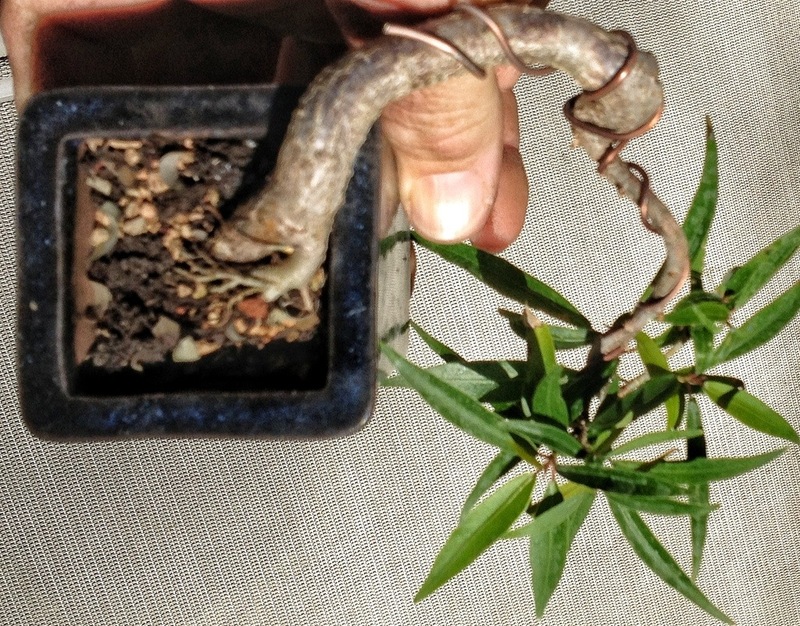 First, a cascade bonsai is not a tree that’s been simply bent down and forced into a cascade; we should let the trees growth decide the style. Second, the first descending angle is important. That’s what really makes a cascade believable. Next, it’s never pretty to watch a man pee. Never. Random twists are more preferable to uniform movement. 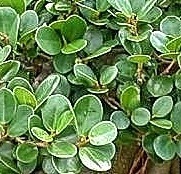 This is ficus salicaria (nerifolia, salicifolia) or the willow leaf ficus. 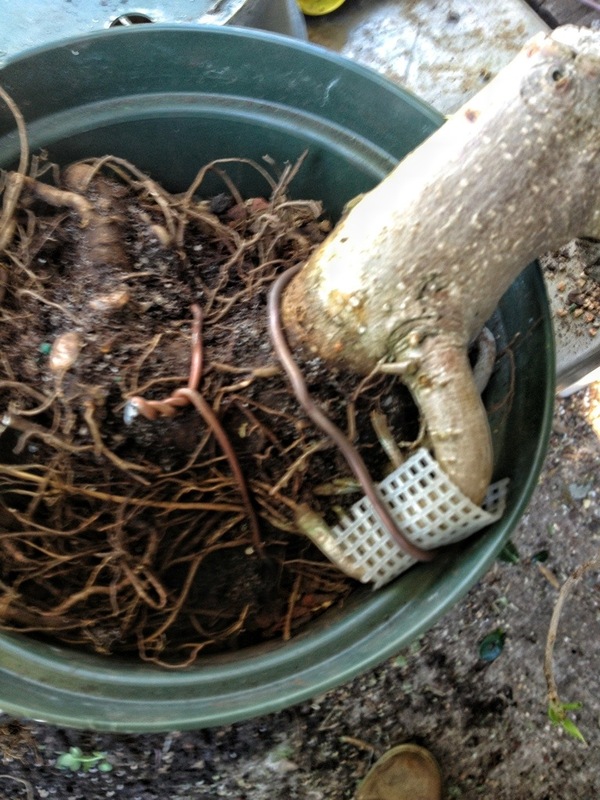 It’s also a root cutting. 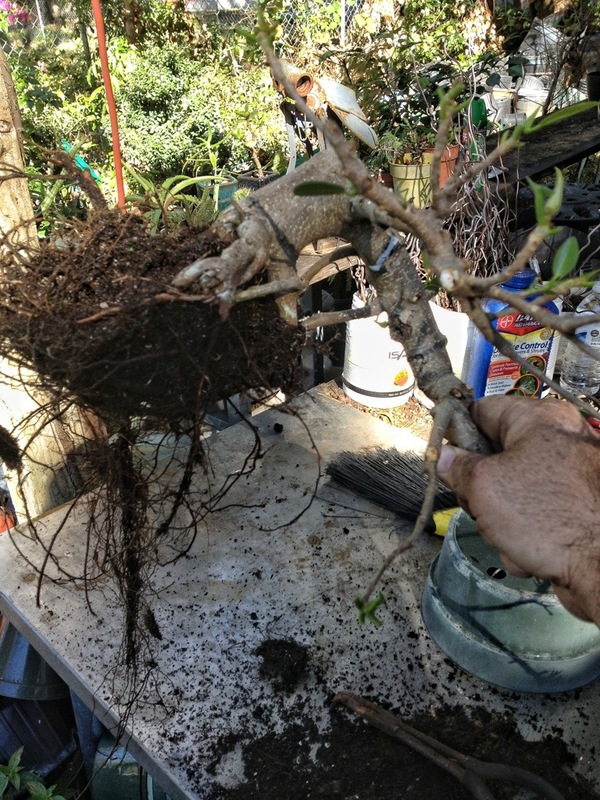 Which means it was actually a root that I removed from a larger tree and it re-sprouted from the end. 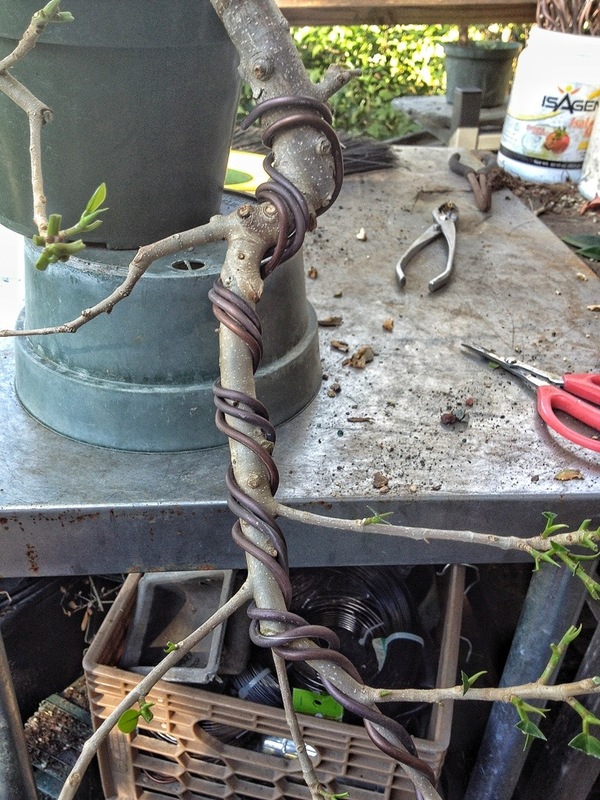 Root cuttings make great cascades. 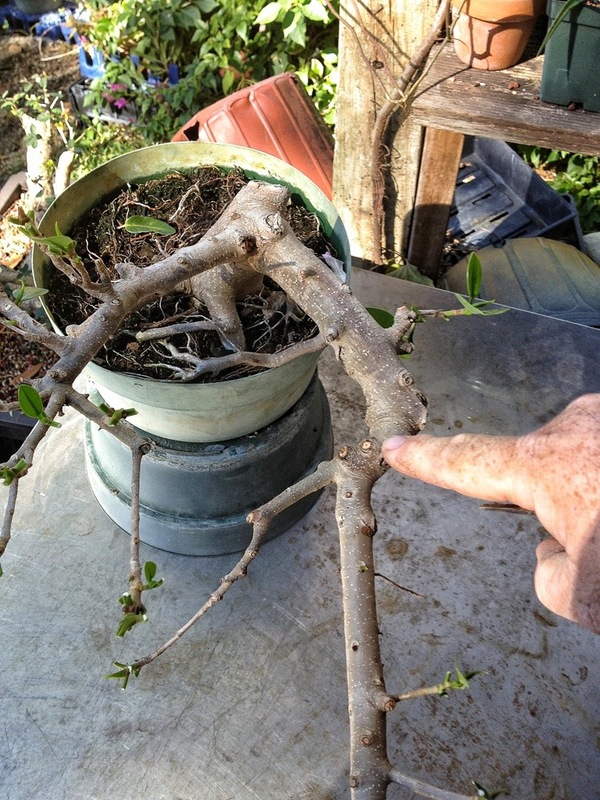 This is a winged elm (ulmus alata) root cutting. 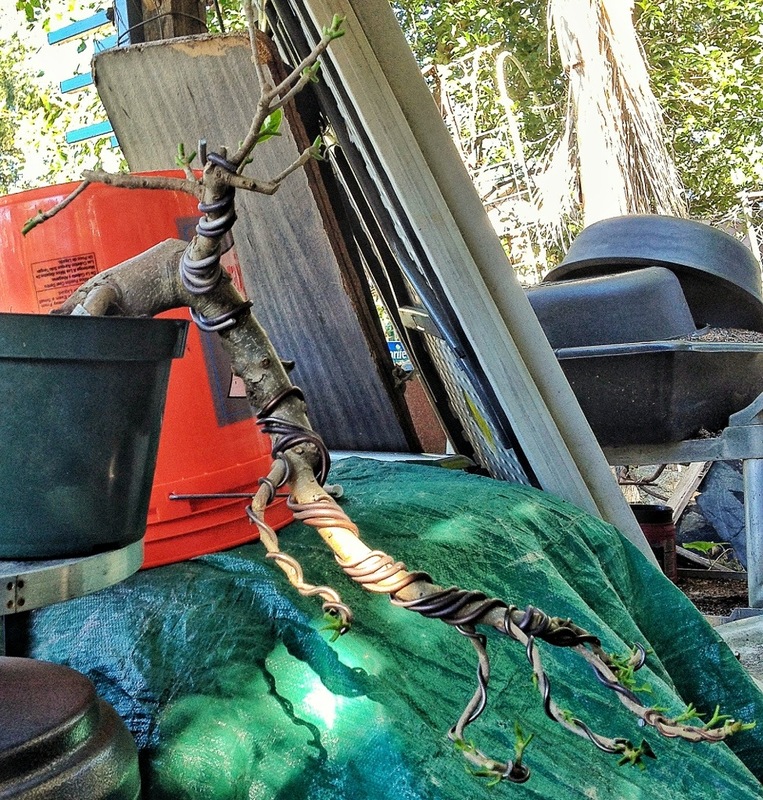 There is no one in the world who could have wired a trunk like that. That’s totally natural. A few more years and that will be a show stopper. If you enjoy my blog please comment and click on the “follow” button at the end. I don’t have any other real way to know if anyone is reading and I enjoy constructive criticism. Mostly. 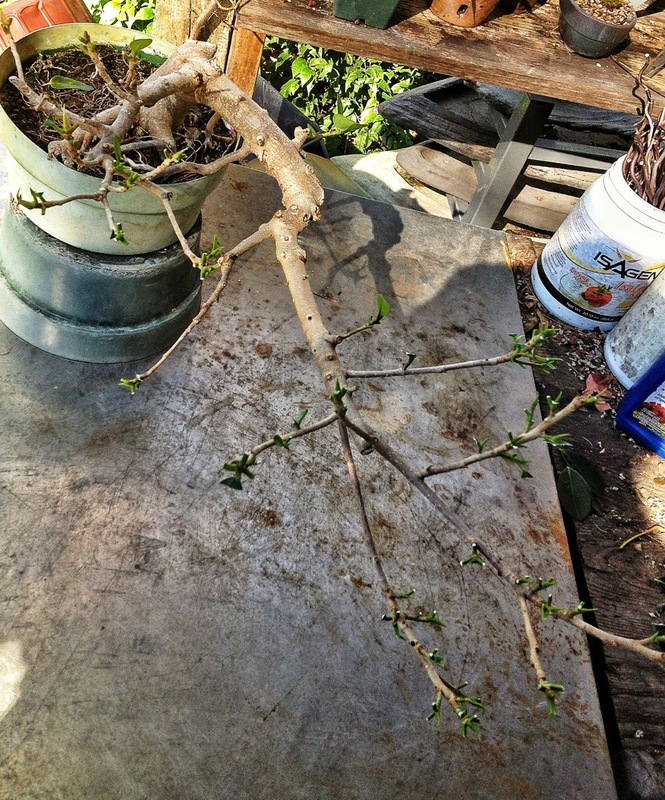 Prev Cascade Juniper: Or….Is it pretty to fall off a cliff? 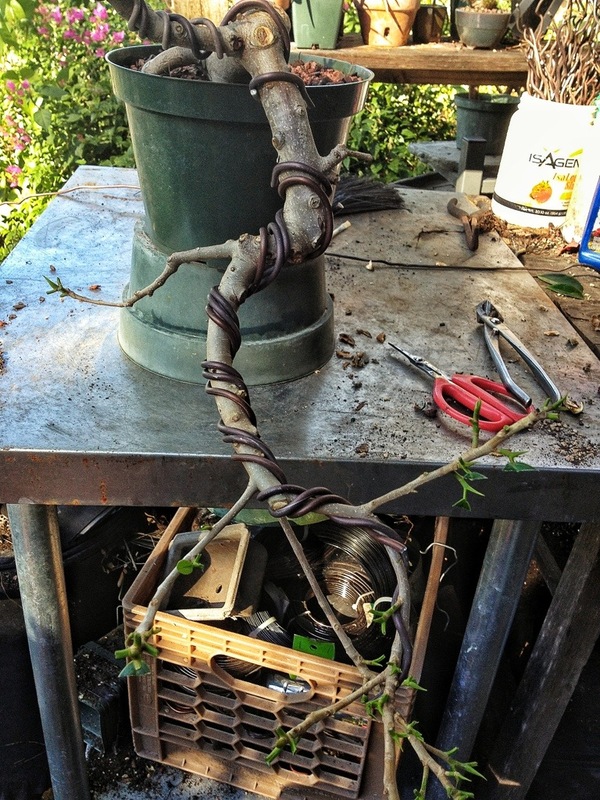 Next Bonsai wire…or, how to annoy your comrades. 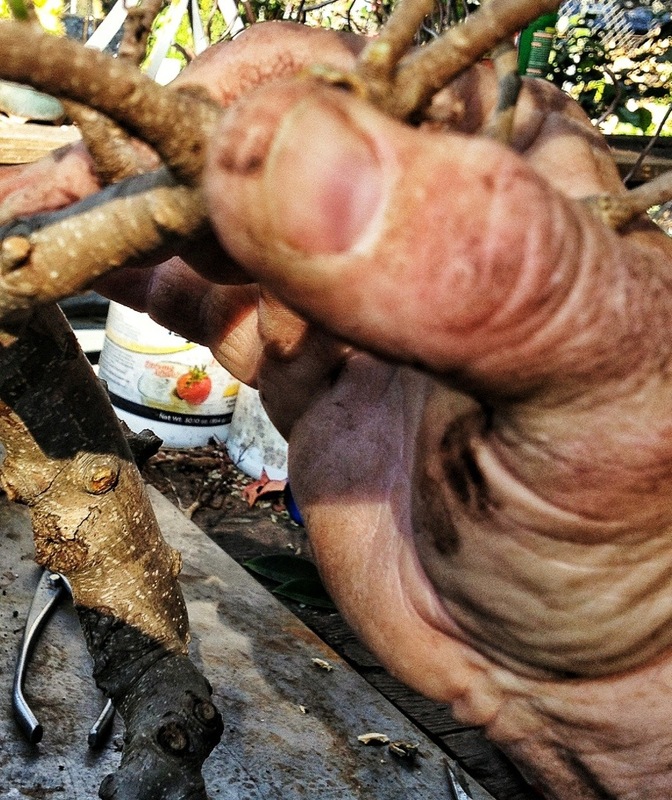 I think you mean ‘drrty bonsai hands’ or possibly even ‘durty bonsai hands’ which would be a slightly modern variant of the classic ‘dirty bonsai hands’. 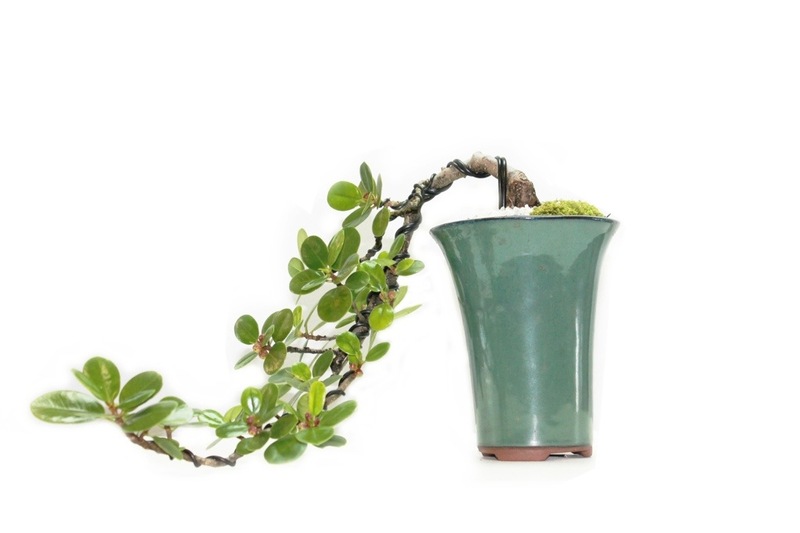 I like to imagine that a cascading ficus would be the result of seeds being deposited high atop a host tree, rather than being a cliff dweller. 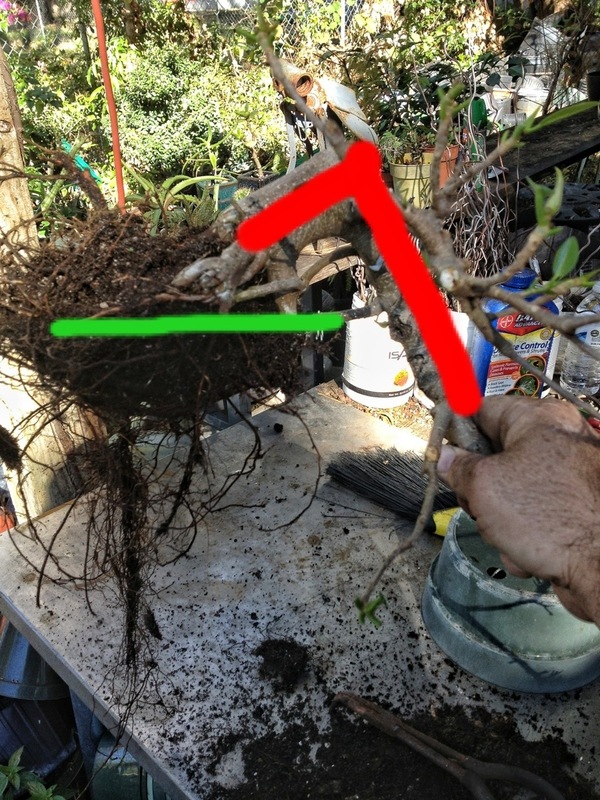 Foliage/branches from other trees would cause the little seedling to snake and bend in an attempt to find patches of light. We certainly are spoiled down here, seeing the defoliation was slightly dramatic, then I remembered that we still have spring-like temps outside. I just started reading your blog about a month ago. Thanks for all the frequent posts! 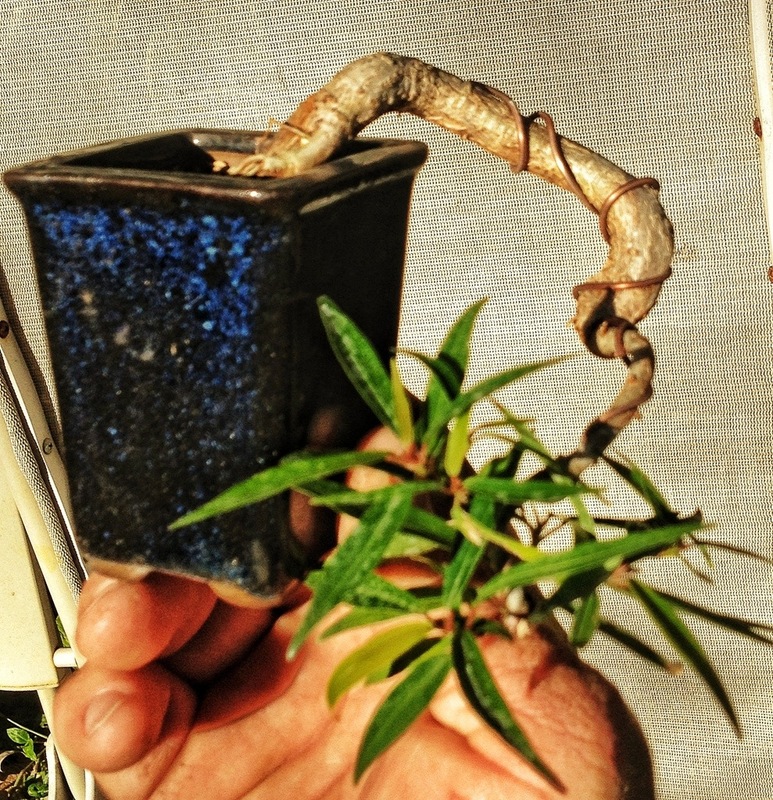 I decided to get serious about bonsai but often find books and class instruction go over some things too quickly or give conflicting information so being able to see lots of pictures helps. It is amazing to see the transformation of the trees. Thanks! DC for the moment but unfortunately or fortunately depending where I’m heading, I move around every few years. If they move you to Florida look me up. Thanks Heather. I know how many see it, just not who. Thanks for the advice and it was an entertaining read too. The fifty shades of chicken is really funny. 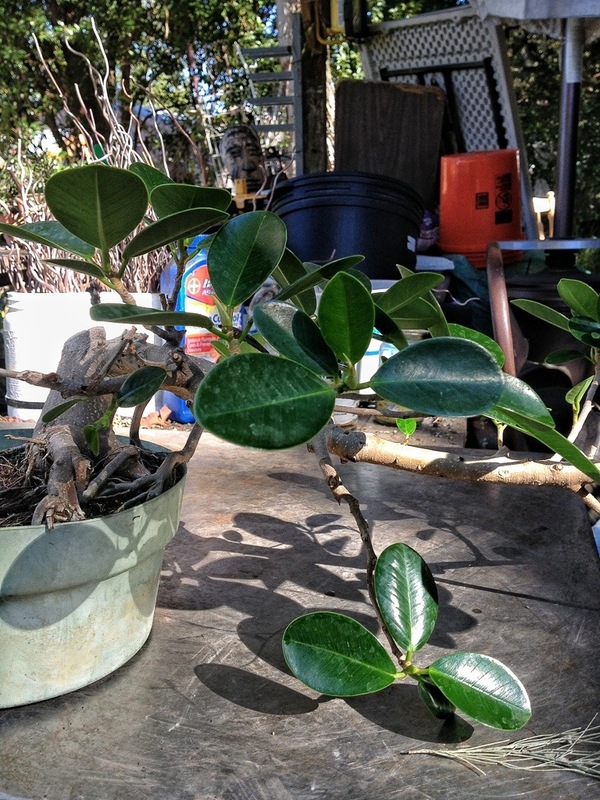 I have just purchased a fig from a local house plant sale but I was not told what variety it was. 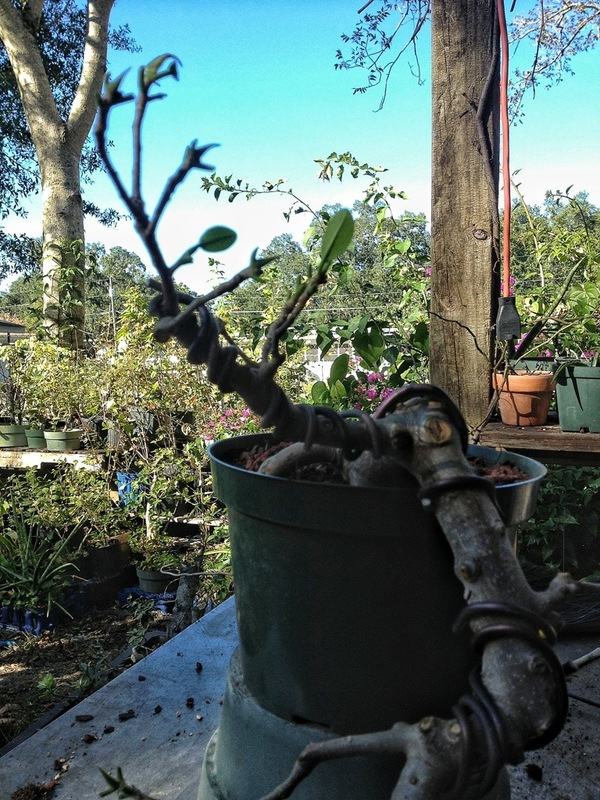 With your blog, I was able to identify the fig as a Green Island Fig and I now have some advice on creating the cascade bonsai I wanted. Thanks. I’m in Australia by the way, so your blog is definitely viewed by a variety of regions.